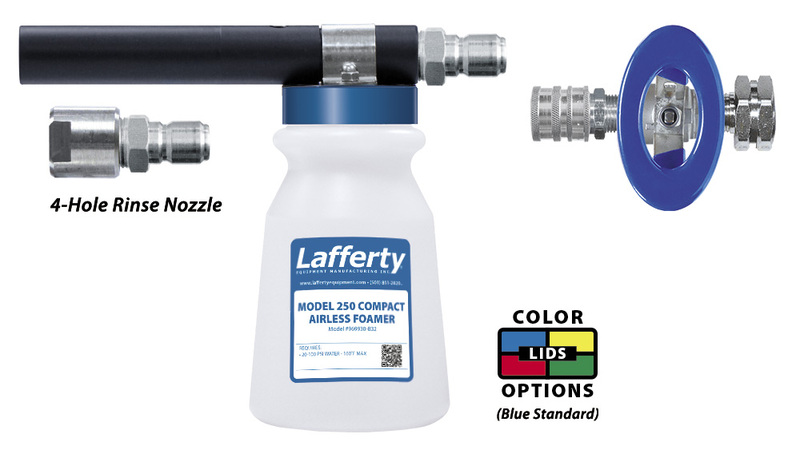 Model 250 Compact Airless Foamer | Lafferty Equipment Manufacturing, Inc. The Model 250 Compact Airless Foamer is a unique medium volume heavy duty hose-end foam applicator for diluting and applying foaming chemicals to any surface. It features ball valve activation and a powerful quick connect 4-hole rinse nozzle. This unit uses city water pressure (20 - 100 PSI) to draw chemical concentrate from the attached bottle and blend it into the water stream. The accurately diluted solution flows through the foam wand to create a clinging, wet foam which is then projected on to any surface up close or at distances up to 12 feet. Quick connect the powerful 4-hole nozzle to rinse. Connects to a standard garden hose or 1/2" MPT and allows for easy activation, even with thick gloves.